Two weeks ago, I bought a pineapple. I placed it on my kitchen counter, claiming that I was letting it ripen for a few more days before I cut it up. A few days went by. The pineapple didn't move. Every time I walked into the kitchen, I saw the pineapple staring at me. I averted my gaze. One morning last week I told myself I would cut it up that night, while dinner was simmering on the stove and I was in the kitchen anyway. That night, I decided to wash some dishes instead. I would cut the pineapple in the morning, while making breakfast. Breakfast came and I was too busy packing snacks and feeding dogs. When I came home for my lunch break, surely I would have to cut the pineapple. But it was such a nice day I decided to walk the dogs instead and barely made it back to work on time. This morning, I finally cut the pineapple and brought a bowl to work for a mid-morning snack. It took me less than five minutes to cut the damn thing and I was a little late for work, but no one minded. The pineapple was delicious. The lesson here? 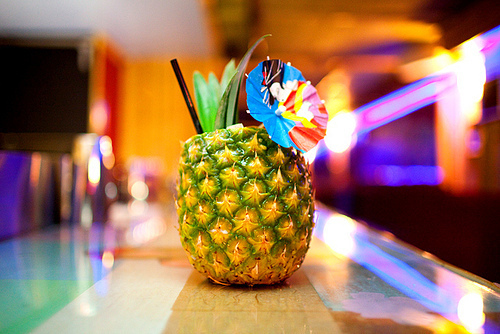 Don't spend more time avoiding the pineapple than you spend enjoying the pineapple.